Mmmhhh, a wonderfully luscious dip! I love to discover something new in our local markets too. Lucky you to have these shipped right to your door. Yummy. 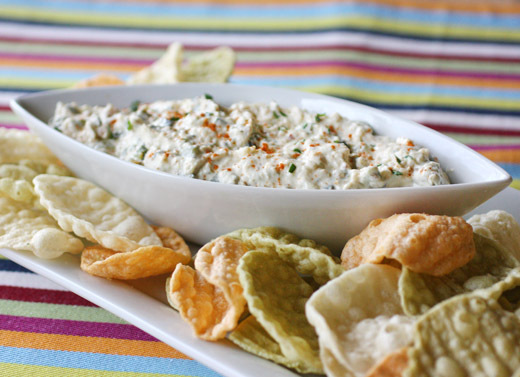 I love dip - those veggie chips are so great for dipping. Carameliyed onions have never let me down..the dip looks yum! I love the roasted poblanos in the dip...something new to try. YUM! I was drooling when I saw you post this on Twitter. This is just the kind of dip I could finish by myself as dinner while watching the Walking Dead. I have fallen in love with Poblanos and Anaheims! And you can't miss with caramelized onions with me.Very nice! (I am mentioning you in an award blog,if you are interested.It will be posted up soon). I would have roasted the poblanos, too. Great looking dip. Isn't it nice to get a package like this! Love those CM veggie chips. I like your idea of pureeing the onions in the food processor to make sure they're evenly distributed throughout the dip. I'll have to give that a try. It's always great to make new discoveries in a familiar surrounding. Roasted poblano are just divine! What a glorious treat, perfect for scooping! amazing dip, lisa. i usually don't even go for appetizer type things because i prefer to save room for dessert, but this is irresistible! Oh how I miss HEB and Central Market! This post made me wish I could go grocery shopping off North Lamar today :-) This dip looks so very good, and I'm eager to recreate it at home. Thank you so much for sharing! There is nothing quite like a dip with crackers of some kind with a cold glass of wine. Sounds like you scored quite a haul with your goodies! 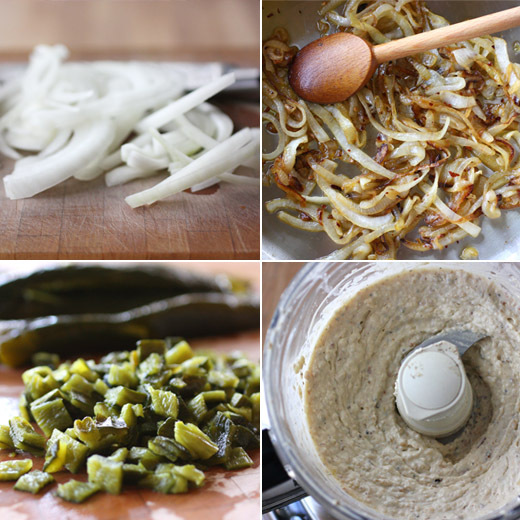 Love this recipe, and I totally agree that a roasted poblano has superior flavor. I've been playing off and on (mainly off) with caramelized onion dips (as a replacement for the soup-based dips), but hadn't considered adding green pepper to it - great idea! Fun post - thanks. Discovering foods at a market is always so exciting! 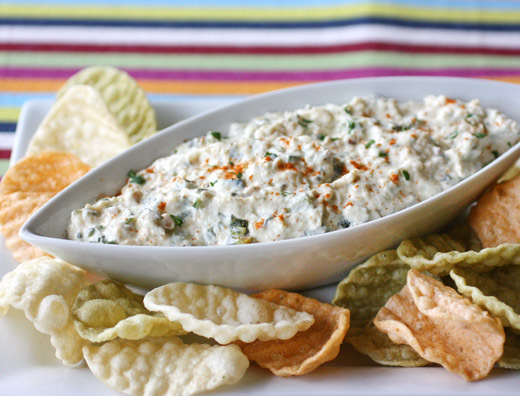 Love the poblanos are roasted in this dip, which makes its flavor pop more! This dip sounds like an appetizing mezze too! The dip looks terrific, and the chips look great too! The gift basket sounds like a real gem. WOW. This looks exactly like something I would LOVE!! I made a caramelized onion dip fairly recently on my blog but I love the sound of the peppers with it, LOVE!! There's something about caramelized onions that makes everything better. This sounds so great! It's the first thing I'm making when I get some hands on poblanos. They are my favorite pepper so I'm always looking for new ways to use them.